The underwater deck plan showing the area repaired in the 1994 project. 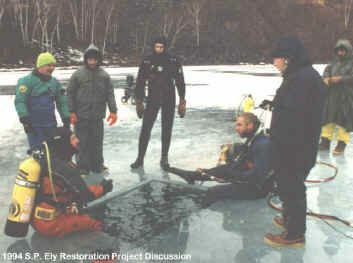 The first project that basically “bonded” the founders of GLSPS was in March 1994 for the Samuel P. Ely Stabilization Project. At the time, the group was basically just a group of well- intentioned divers and shipwreck enthusiasts. The GLSPS was formed after the group proposed to do the SS. America preservation project in a national park in 1995 and decided a more formal organization would be in order. The shipwreck S.P. Ely, built in 1869, is a relatively intact 200-foot long schooner which sank in a storm in 1896 at Two Harbors, Minnesota. It is located inside of the west break-wall of the Agate Bay harbor and is visited by many sport divers each year. In 1991, the Army Corps of Engineers and their contractors repaired and significantly changed the structure of the break-wall in which a part of the Ely is embedded. In spite of a reasonable effort to minimize the damage to the Ely by the Corps et al, the fragile stability of the Ely was disturbed. The change to the environment seemed to accelerate the rate at which the sides of the ship were spreading causing the collapse of two major sections of its deck. Those who dove and enjoyed visiting the wreck were concerned that within five years the wreck would be reduced to a pile of timbers. 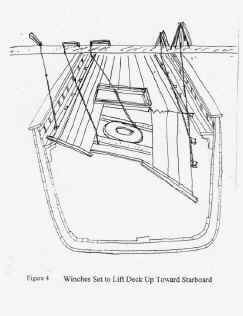 The plan devised was to tie the spreading sides of the hull together using steel tie rods with turnbuckles. 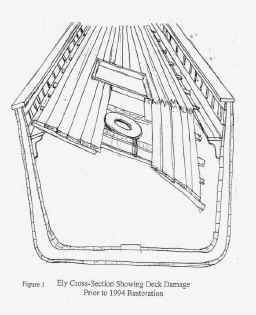 This was not such an unheard-of remedy, since many of the later wooden ships were designed with similar support systems called truss rods. These were used to strengthen certain parts of the hulls. 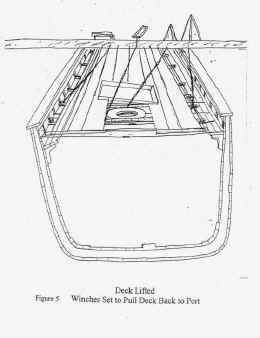 Before the tie-rods were installed, the collapsed deck section would be lifted back into place and it was hoped that the sides could be pulled in enough that the deck beams would again sit on the supporting shelves. If the deck slid off the shelves again the tie-rods would support it. The group sought help from several government agencies without success. This type of preservation work had never been done before and, of course, there was quite a bit of questioning whether it was feasible. With only the money the team was willing to spend themselves and a few small donations, the team was forced to rely on some ingenuity to keep costs down. The solution was to do the work in the winter through the ice. The harbor ice made an excellent stable platform for lifting the fragile deck and also allowed plenty of room for equipment. Once we had a well thought through plan, it was truly an encouraging feeling to see one after another person volunteer his time and talents to help in preserving this shipwreck. Jeff McMorrow, the head of the Two Harbors Historic Society, opened his home, the lighthouse keeper’s house, to let the team sleep on the floor. LeJuene Steel made the rods for the cost of the steel. 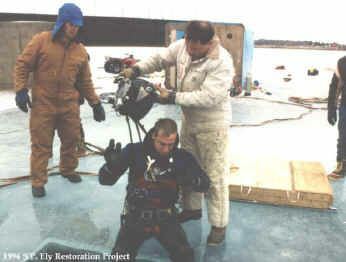 Commercial diver Jerry Provost of Vet’s Salvage donated his time, talents, and equipment to make the project a success. All team members donated the use of their own equipment and shared transportation expenses. Pat Labadie coordinated communications in Duluth for us, and the list goes on. The project was a complete success at a cost of $100 for materials, and all who participated felt good about what they and completed in a weekend in March of 1994. This was the project that substantiated the feasibility of doing the work and made all of us realize the necessity of continuing the direction. Two years later, the group incorporated a non-profit organization called the Great Lakes Shipwreck Preservation Society which continues to push the envelope and develop new programs to preserve our deteriorating shipwrecks. Ely cross-section showing deck damage prior to the 1994 restoration. Winches set to lift the deck up toward starboard to clear the shelf. Things don't always go as planned, but the group learned to solve problems as they arose during on-site discussions. Jerry Provost tending Ben Erickson, who spent hours under the ice learning the best way to drill holes through eight to twelve inches of 100 year old white oak. 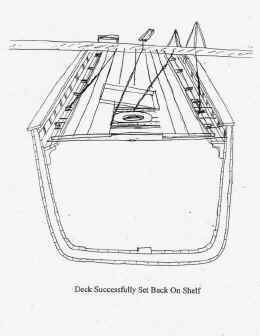 After the deck was lifted, the winches were reset to pull the deck back to port on to the deck shelf. After the deck was successfully pulled back to the port on to the shelf and the tie rods installed.